Now that fall is in full swing, I’m craving warming spices that nourish me down to my roots. Curries always fit this bill and are a wonderful, healthy weeknight meal. The green tomatoes add a lovely zing to this dish and complement the sweet squash and peppers. If you already have curry powder in your pantry, feel free to use it. Otherwise, I’ve included a recipe for Garam masala below. Keep in mind, curry powders lose their potency over time. They are at their best within a month from grinding them. So, if you’re using an old tin of curry powder from the back of the cupboard, you may find you need to double the amount in this recipe to get the flavors to come through. Green tomatoes offer their own unique flavor and are full of tons of nutrients! Green tomatoes are an excellent source of vitamins C, B-complex, A, and K. Eat up! 1. In a large pot, melt butter and sauté onion over medium heat until translucent. Add garlic, spices, and tomatoes. Cook until tomatoes begin to break down, about five minutes. 2. Add coconut milk and squash to the pot. Bring to a very low simmer- barely bubbling. If the sauce is too thick, thin with 1/4 cup of water or stock. Cook for twenty minutes then add the sweet peppers. Cook until the Kuri squash is easily pierced with a fork- about 5-10 more minutes. Add salt to taste. 3. 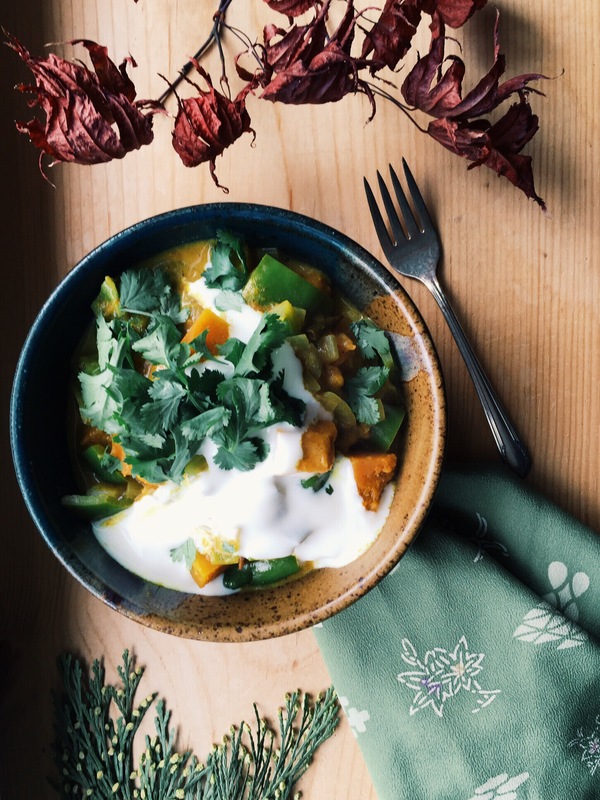 Serve curry over rice with fresh cilantro and a dollop of yogurt. This recipe serves 4. Toast all spices in a skillet over medium heat until fragrant. Remove, allow to cool, then process in a spice grinder until a fine powder has been achieved. This recipe makes about 3 tablespoons.